(Trent Nelson | The Salt Lake Tribune) Utah Utes running back Zack Moss (2) runs between Weber State Wildcats safety Jawian Harrison Jr. (2) and Weber State Wildcats cornerback Keilan Benjamin (10) as the University of Utah Utes host the Weber State Wildcats, Thursday Aug. 30, 2018 at Rice-Eccles Stadium in Salt Lake City. Utah running back Zack Moss is staying in school through the 2019 football season, partly because he wants to obliterate the program’s career rushing record. Beyond the yardage, Moss’ legacy will include altering how the Utes staff his position. In each of the first six seasons of Utah’s Pac-12 membership, a junior college transfer led the team in rushing. 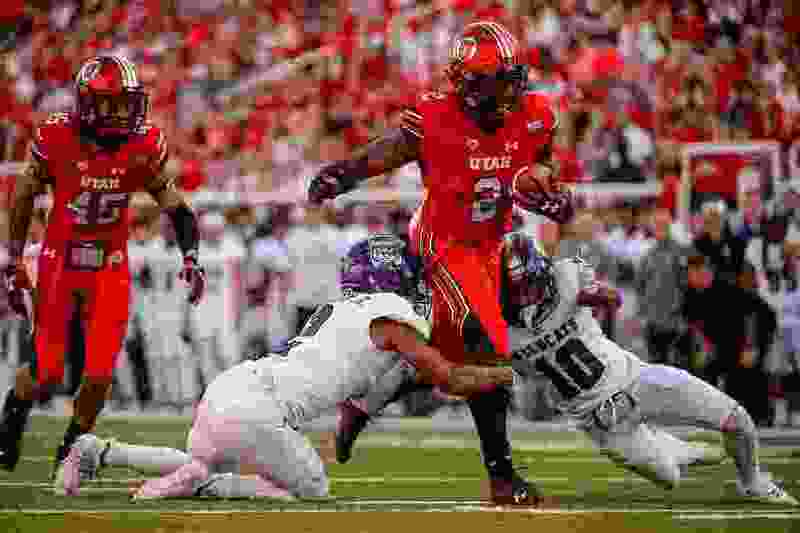 Moss changed that as a sophomore in 2017, and now Utah has a long list of running backs who are developing in the program after being recruited out of high school. John White (2011-12), Bubba Poole (2013), Devontae Booker (2014-15) and Joe Williams (2016) were JC transfers who thrived at Utah. That method worked, as the Utes kept finding replacements every two years or so. But now the coaching staff can work young players into the lineup in various roles, as they try to establish themselves. California products Micah Bernard, who signed in December, and Jordan Wilmore, who was added last week in the February signing period, join a position group that is built to last. Of the Utes’ seven scholarship running backs, senior Armand Shyne is the only player who came from a junior college and four are freshmen or sophomores. Shyne is the biggest variable in what the Utes' depth chart will look like in 2019, with spring practice starting March 4. Bernard and Wilmore will arrive on campus in June. In basically a one-back offensive scheme, Utah will have high-level competition for playing time behind Moss, who's recovering from a knee injury that sidelined him in early November. Moss expects to have a heavy workload in 2019, and new offensive coordinator Andy Ludwig understands that maximizing him is a big part of his job description. Yet no college running back averaged more than 23 carries per game last season, and Utah will rely on backs other than Moss. Utah quarterbacks Tyler Huntley and Jason Shelley will remain involved in the running game and the Utes will mix in other backs. Devin Brumfield and TJ Green showed signs last season, Devonta’e Henry-Cole is back after missing a year due to a preseason injury and Wilmore expects to play right away. In announcing his choice of Utah, he said he was coming for “the next three to four years,” anticipating an NFL career. Bernard, who turned 17 in October, is a likely redshirt candidate. Shyne rushed for 174 yards against Oregon in his first start as Moss' replacement, but his production dropped off significantly after that. He totaled only 172 yards in the remaining four games, including losses to Washington in the Pac-12 championship game and Northwestern in the Holiday Bowl. So he’ll have to perform well to hold off challenges from younger players. Brumfield may become the primary backup to Moss, with Green and Wilmore in specialized roles. The 5-foot-8, 199-pound Wilmore “reminds me a lot of Zack Moss,” Ute coach Kyle Whittingham told ESPN 700, describing him as an “explosive runner; thick and durable” and having a good attitude and work ethic. Wilmore rushed for 2,000 yards in each of three seasons at Lawndale (Calif.) High School and chose Utah over Arizona State and UCLA last week, after having decommitted from USC in mid-January. Seniors – Zack Moss, Armand Shyne. Sophomores – Devin Brumfield, TJ Green. Freshmen – Micah Bernard, Jordan Wilmore. Colorado – 17 carries, 55 yards. BYU – 15 carries, 47 yards.